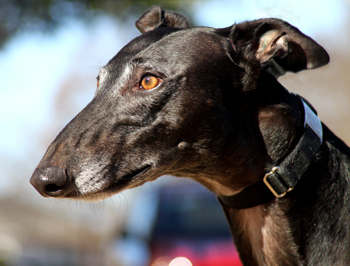 Caesar, aka SL Java Jive, is a 5-year-old black male born April 17, 2006. His sire is Craigie Whistler, making his grand sire the famous Molotov, and his dam is Sl Tri Cia. By looking at Caesar's pictures, you can probably guess how he got his name - he has the most striking roman nose. 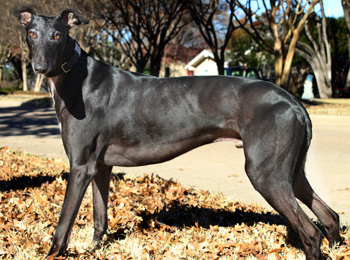 Caesar has no races to his record and was found as a stray in the Waco area when he wandered up to a beauty salon. Lucky for Caesar, they took him in. Caesar was adopted and in a home for several years; however Caesar developed seizures. It was determined that the environment he was in, was not the best situation for him or the families' others animals. Caesar is on daily medication and will be for the rest of his life for his seizures. Caesar is cat tolerant and will be tested with small animals at a later date. 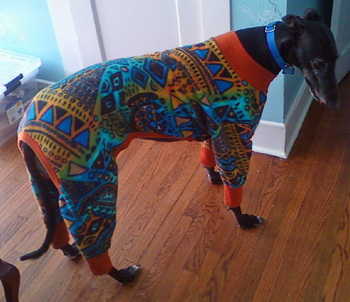 He thinks he looks really fly in his Cosby sweater. 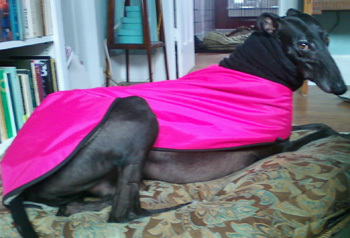 He is secure enough to wear our girl dog's hot pink coat when his Cosby sweater is in the wash. He's magic at raiding the cookie jar. Despite his demonstrated playtime agility, he will not jump in the back of the hatchback because he knows I need to work on my upper body strength, and really, what better way than loading an 80 lb dog. If you open the hatchback, then drop your keys/groceries/bags, he will patiently wait for you to get it together before stepping away from the car. He will drink 48 ounces of water in one go. He would probably go to a gallon if we kept pouring. 6A. Closely related skill: remeber the scene from Austin Powers: International Man of Mystery where he wakes up after 29 years and has his first pee? If that scene amuses you, then walking Caesar on a leash will enable you to relive the joy. He is beyond cat safe. The feral cats in our neighborhood daily try to provoke him, and his face says, "Guys, really. We're better than this." He takes his daily meds for epilepsy pleasantly and without fuss. He has never had a seizure since coming back to GALT. He looks like Severus Snape in dog form, and like Severus, he is much sweeter than the darkly brooding exterior implies. He is a low-key dude. He abides.